November 14 through December 3: Survive the Night and other events to fight homelessness. Sep. 28 -Oct. 2 (Monday, Tuesday, Thursday, Friday): Soloists in Concert: Live Performances at Noon, Oviatt Library's Music & Media, 2nd floor, East Wing. 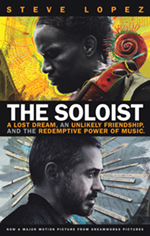 NPR's Fresh Air: "The Real Story Behind The Soloist." 4/24/09. 60 Minutes: "How Mr. Lopez and Mr. Ayers Became Friends." 3/22/09. Downtown Los Angeles: Skid Row, Disney Hall, and Other Points of Interest. Think DIGLA. In today's Los Angeles Times, Steve Lopez writes about Nathaniel Ayers and his latest project: making a music CD: "Mr. Ayers--recording artist." Steve Lopez gave the Freshman Convocation keynote speech on Thursday, September 3, 2009. If you missed, it check out the captioned videotape. 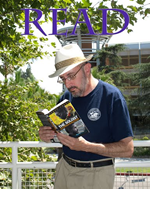 The Common Reading Selection Committee chose The Soloist by Steve Lopez as the Freshman Common Reading for 2009-2010. We invite all members of the campus community to continue working with us to develop additional ways of teaching and learning with the book. This website offers assignment ideas, links to relevant websites, and suggestions for further reading. Want to add something? Please contact Cheryl Spector. "How Mr. Lopez and Mr. Ayers Became Friends": 60 Minutes episode (3/22/09; repeated 9/6/09). Morley Safer talks with both men, and Nathaniel plays cello. 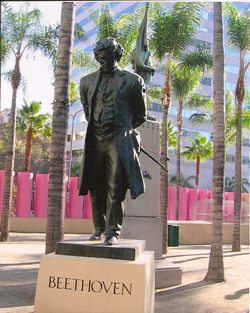 Photo of Beethoven's statue in Pershing Square by Sharron Kollmeyer Gerfen. This list is a work in progress. Got an idea? Share it: fill out this form (.doc or .pdf) and/or email it to me: Cheryl Spector (cheryl.spector@csun.edu). For Fall 2009 examples, see the photos from the Freshman Celebration. Live performances: Soloists in Concert at Oviatt Library, Music & Media, 2nd floor, East Wing: performances at noon on Monday, Tuesday, Thursday and Friday, Sep. 28-Oct. 2, 2009.
Who Else was Reading The Soloist in 2009-10? Early spring 2009 faculty/staff book groups: an opportunity to discuss The Soloist with colleagues across disciplines and divisions. Ideas for Teaching The Soloist by Steve Lopez. April 21 and 22, 2009.